Linssen Yachts welcomes all visitors from Australia and New Zealand to our website. Linssen Yachts builds steel motor yachts from 30 – 60 feet (9 – 18 meters) and delivers them throughout the world. Linssen Yachts is known for its series production of steel motor yachts. This results in a very high quality, efficient production and acceptable pricing. Please use the menu buttons on top to browse to the model of your choice. The yachts series have different characteristics and styling. Depending on your cruising area, number of people on board, taste, experience etc. you will be able to find the Linssen yacht of your dreams. We have many clients from North America, Canada, Australia and New Zealand that cruise the European waterways for many weeks a year on board of their Linssen yacht. The European waterways are very extensive but easy to sail with locks and large marinas. The steel displacement motor yachts from Linssen are very well suited for all these destinations. The Linssen sales and service network throughout Europe will help you in case of questions or winterizing your Linssen yachts. Many of our clients report on their travels trough the five Linssen Owners Clubs and many also maintain a blog, Twitter or Facebook account. Visit our Owners page and read all about their discoveries. 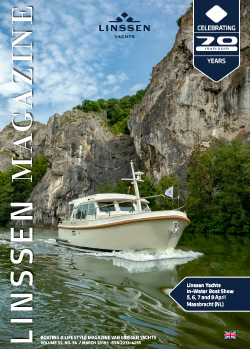 Read more about Own you Linssen boat in Europe. For information, pricing and extensive specifications you can also contact the Linssen shipyard in Maasbracht, the Netherlands directly. We can answer your questions on buying a luxury motor yacht overseas and the options and possibilities of cruising Europe.